Sock Innovation by Cookie A. manages the difficult task of trying to be two things at once and succeeding brilliantly at both. Not only is it a great collection of sock patterns but it’s also an amazing resource for anyone with an interest in designing their own socks. 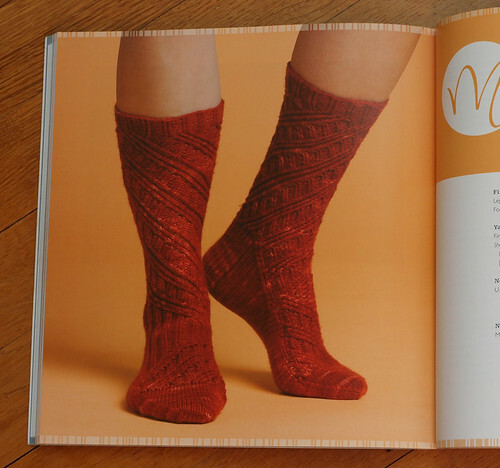 It straightforwardly walks you through many of the issues that need to be considered: how to convert flat stitch patterns for knitting in the round; how to work out where to place the patterns so that they flow nicely into heels or toes; how to invert cable and lace patterns so that they can be knitted in the other direction. There are also descriptions of how to work some of the most common types of heels and toes. Row 1: Sl1, kX, ssk, k1, turn work. Row 2: Sl1, pY, p2tog, p1, turn. Repeat rows 3 and 4 until Z stitches remain. Until I started designing my Irish Stout Socks, I had never given any thought as to how someone would determine the number for X, Y and Z. For those socks, I figured it out by trial and error but going through that for every sock design would be extremely frustrating and time-consuming. Sock Innovation contains a comprehensive table for values of X, Y and Z based on the total number of stitches in your sock so I never have to do my own calculations again! 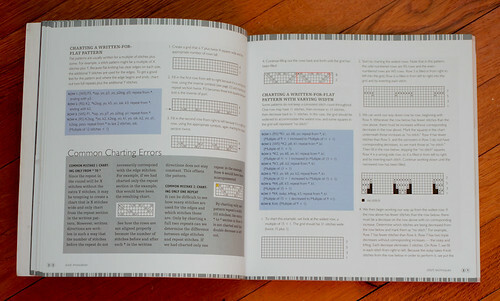 The second half of the book is a collection of 15 patterns that demonstrate the techniques from the first half. There are patterns with multiple stitch patterns that transition into each other; socks with mirrored patterning; socks with non-standard gusset decreases. One of my favourites is Rick, shown below, which has a diagonal twisted rib pattern. 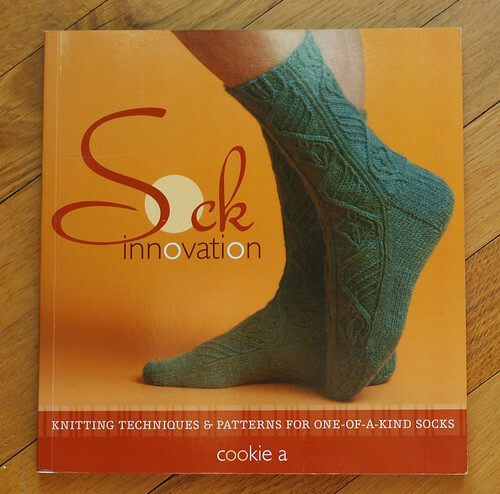 So, whether you want to design your own socks or just knit fantastic socks with interesting construction, you’ll find something of value in this book. This entry was posted on Saturday, January 26th, 2013 at 2:10 pm	and is filed under books, knitting. You can follow any responses to this entry through the RSS 2.0 feed. You can leave a response, or trackback from your own site. I love this book – I’m currently (v. slowly) working my way through the patterns but I have a couple of ideas for designs of my own so need to sit down and read through the front again so I can get them down properly. I haven’t knitted any of the patterns so far but you’ve just reminded me that I do have some sock yarn that I haven’t decided what I’m going to use it for yet. I might see if it would work with any of these. Good luck with your own designs!